All patterns are Adobe pdf for free download and printing. They print out onto sheets of 8.5 x 11 printer paper which you tape together then cut out. The different pieces have different types of dotted lines to make it easier to match them up. Be sure they print out at 100% size not "scale to fit" the paper. 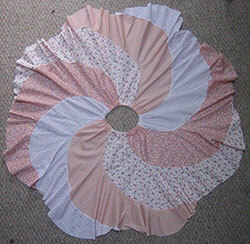 The skirts can be made any size by using the right number of gores you need to get the waistband size you want. 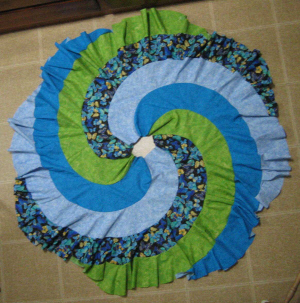 A gore that's 6" across the top will come out about 5.5" (it's easier to use narrow seams when you're matching two contrary curves) so if you want the top of the skirt before elastic to be 44" you'd use eight gores. Allow enough width to pull up over the hips. One top piece and one point piece are sewn together to make one gore, which are then sewn together. The shapes are 6" wide at the top. 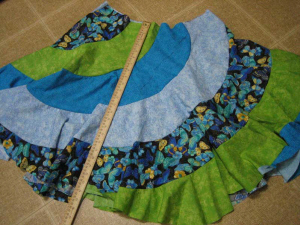 Using one top piece and one point per gore, and allowing for an elastic waistband, the skirt comes out 25" long before hemming. 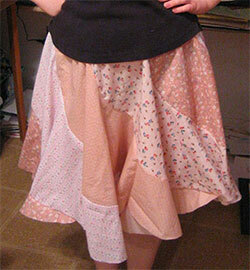 Here's a Skirt 3 in progress, showing the interesting way it looks before sewing up the final seam. You can make it longer by adding more of the top piece before putting on the point, as in this blue version. Here's one from the mailbag: Julie says she, "added a 6" strip at the top to make it longer, and lined it. Looks great! 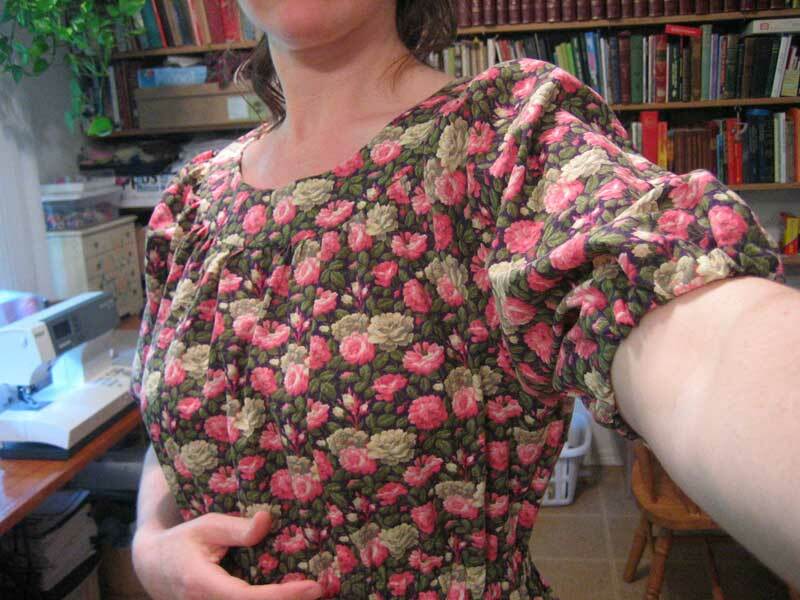 I used scraps of rayon, georgette, and one of those big challis scarves that was popular in the 80s. 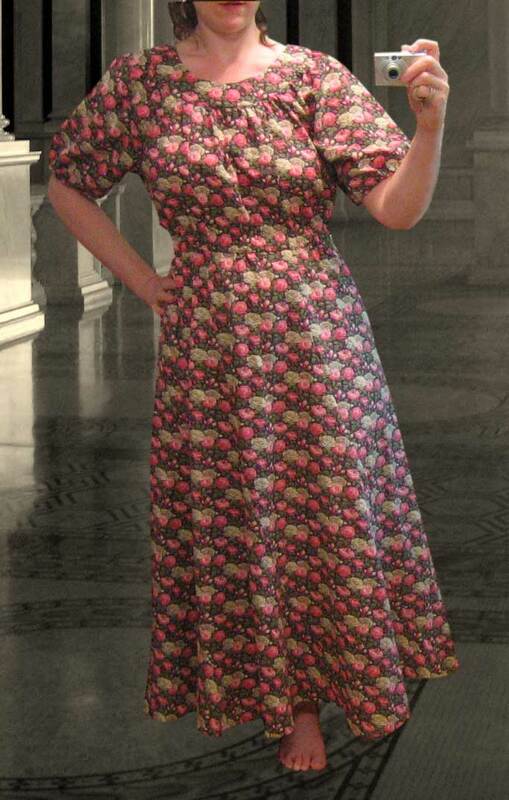 Thanks so very much for posting the patterns; I've been wanting one of these for many years!!" 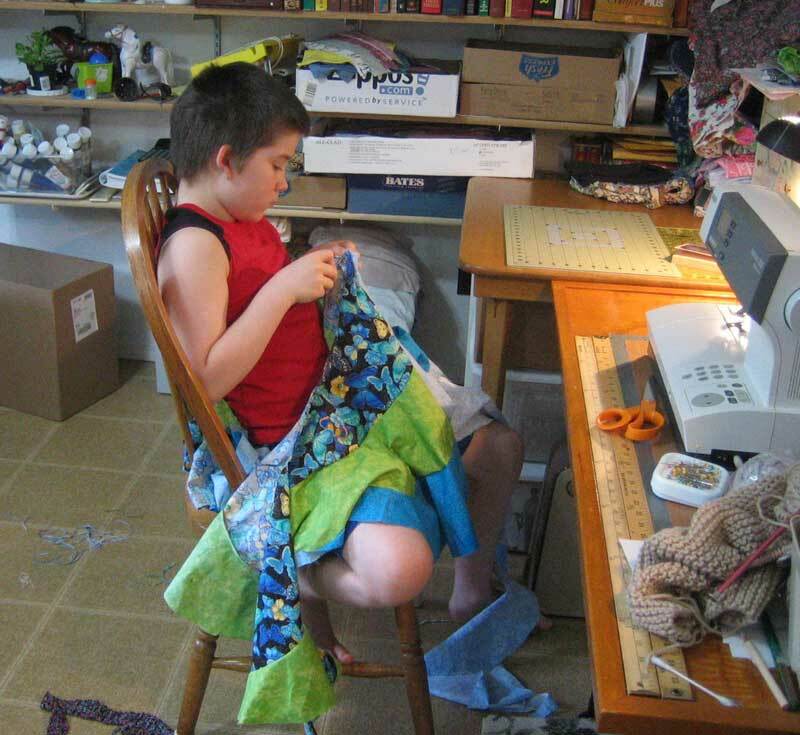 THANK YOU to Julie for sending pictures of her project! 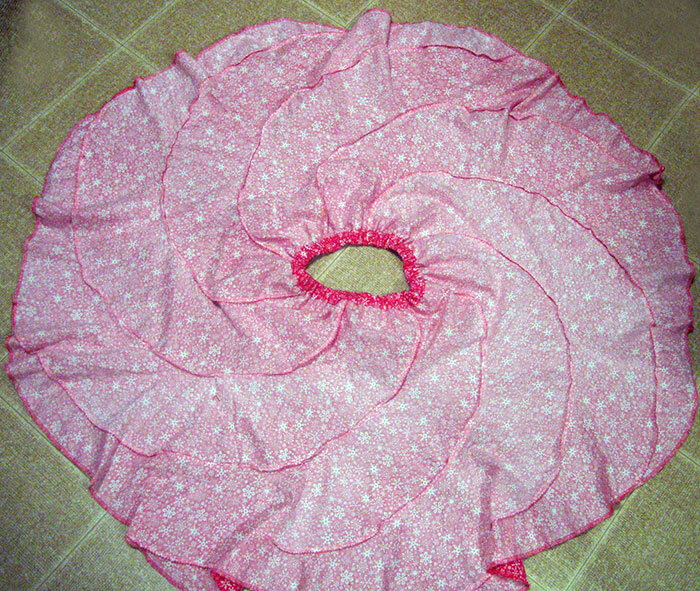 Skirt shape based on sections of a perfect circle. The sections are 8" wide. 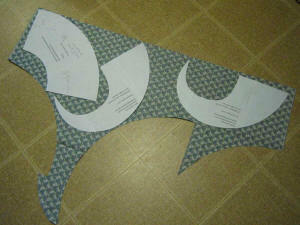 In this version there's lots of sections to join before sewing the gores together. 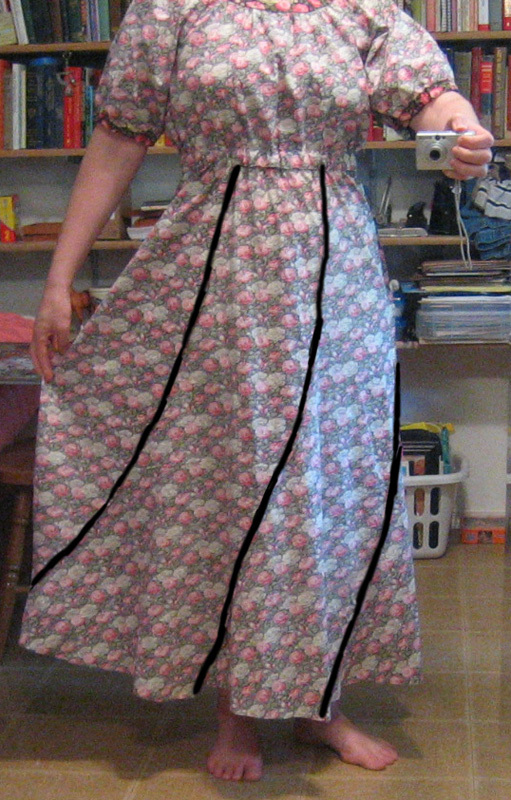 For my dress I used four top sections and one point per gore. 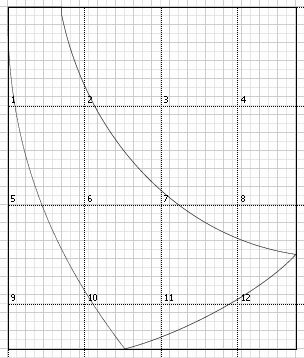 Adding more sections would have made it longer and I probably will next time, but due to the spiral design, the added length gets absorbed into more ruffliness so another section won't add as many more inches to the length as you might expect. 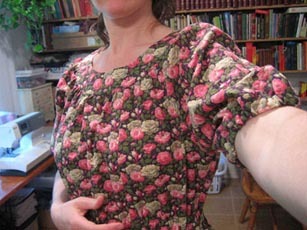 And here's the raglan top part to download. You need to print both files to make the dress. Instructions are in this file and there's pictures on the original pages. The top / dress pattern is size medium only. I'm 38-30-42, you can see how it fits on me. Skirt comes out an uneven 27" long, using three top sections and one point per skirt gore. 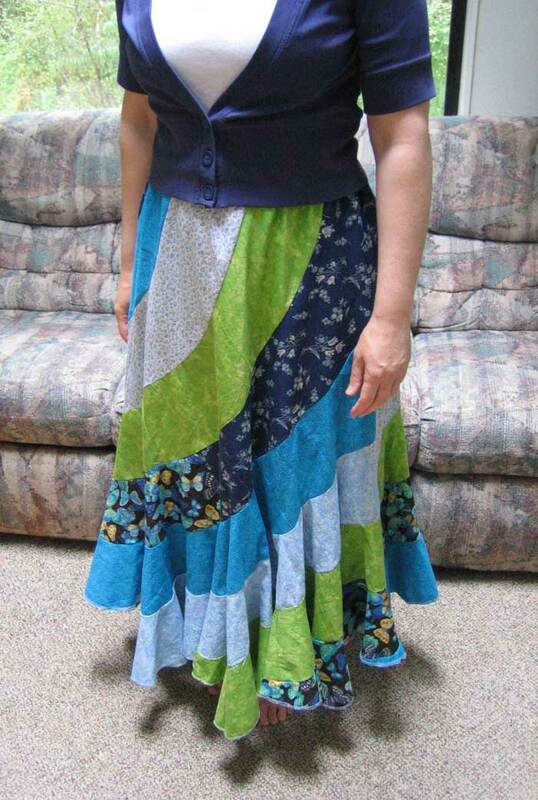 Same skirt as above, but with 6" panels instead of 8"
Comes out quite short and very twirly, only 20-22" long (uneven hemline) including the waistline casing. That would work best for little girls. 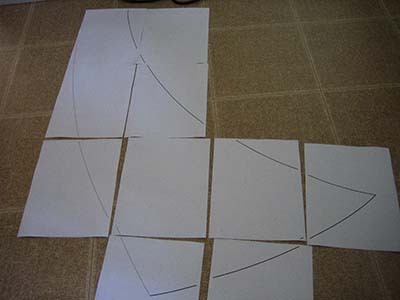 Each gore is cut in one piece and requires a 25" x 23" piece of fabric. 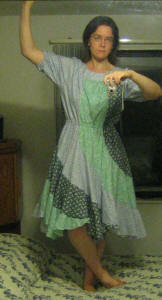 Little wrinkly there, one of these days I'll learn to contain my enthusiasm long enough to iron things first. 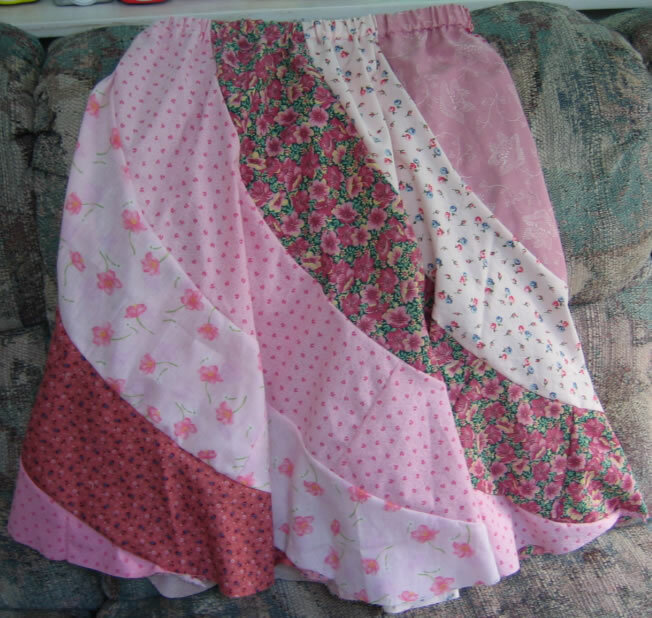 The pink skirt was made with a somewhat wobbly hand-drawn pattern piece. The red one was exactly the same, but perfectly circular lines made in AI. The red one's inside-out so you can see the seams! 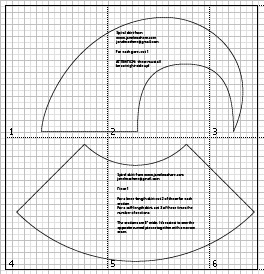 This makes a gently-curved, conservative swirler shape similar to the commercial patterns. Here's the dress made with it. One's inside out to show the seams, otherwise they'd be too hard to see! I was absolutely in the Library of Congress for the first picture. It was not my regular sewing room with the bookshelf and the junk behind me like the other two. 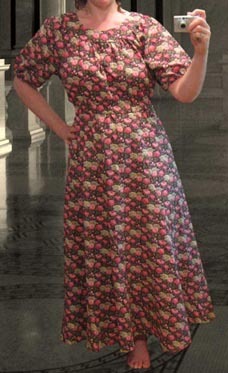 Fabric requirement for this dress would be 4 and 2/3 yards-- in theory according to Illustrator! See how I figure it out in IL? I fit the pieces into a 44" wide box and see how long the box needs to be! It says it's 163 inches. 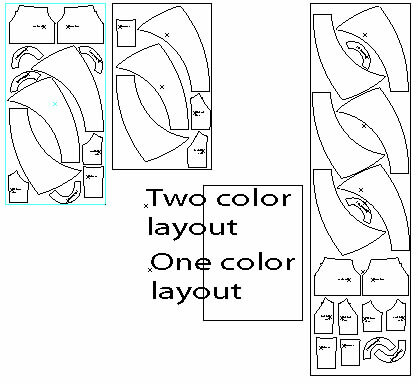 For a two-color arrangement it would be 89" for the color that the sleeves are made of, and 73" of the second color. 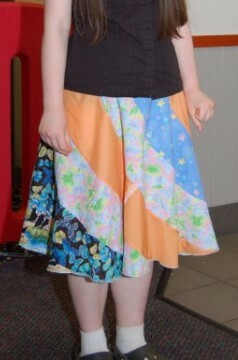 I wanted a REALLY ruffly skirt for myself. I tried using five panels of Skirt 4 with the 6" wide gores. It came out BEAUTIFUL-- but only 24" long! Tighter curls means shorter length as the fabric is absorbed into ruffles. I pondered this for a while. It's simply too short for me. 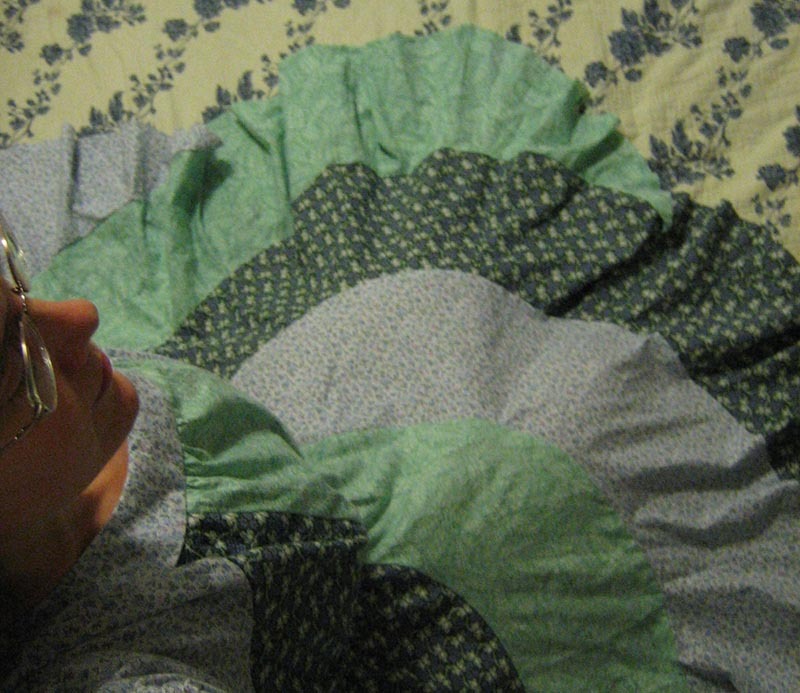 If only I knew someone's beautiful little daughter who needed a ruffle skirt! If only all those seams would unpick themselves! But I have a secret weapon, a little buddy who will do it for $5. 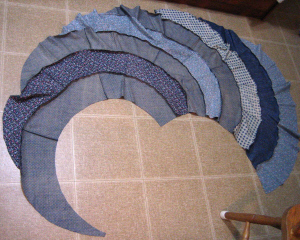 To the top of each section I added one panel from skirt 3, which is a gentler curve. 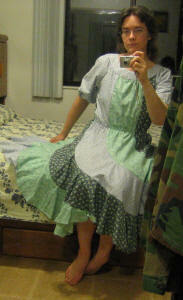 Then sewed it all together again, and it came out perfect. I'm glad I did because I really like these colors! 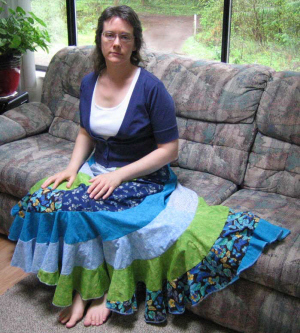 SUMMARY of how to make this exact skirt-- each gore is put together using ONE section from skirt 3, then FIVE sections from skirt 4 (with the 6" wide option) and then the tip from skirt 4. Remember you can cut some or most of those sections together to save on sewing the pieces together, if you have plenty of fabric.